Facebook Ads Become a Cesspool of MLM and Work From Home Scams. 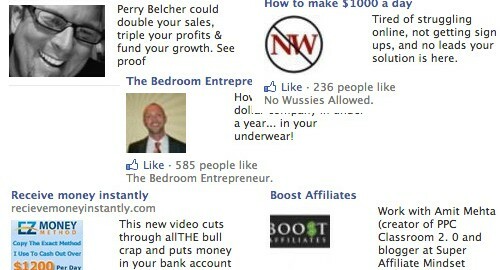 Recently I’ve noticed that my Facebook ad feed has become a giant cesspool of work from home scams, multi-level marketing (mlm) or worse convicted felon Perry Belcher looking for a high paying job and equity with your startup. It started maybe 2-3 weeks ago around the holiday season when most of the ad campaigns for holiday goods and services were winding down and began to be replaced with a variety of work from home and make thousands type advertisements. It’s now to a point that any time I login I get bombarded with junk (not that Facebook ads were all that amazing to begin with) and most of it would violate the TOS of major search engines and other ad providers. In fact one of the ads for a WordPress SEO plugin promising page one rankings has the same domain of a site that regularly fills up my spam filter. Guidelines for Facebook ads ban the usual suspects but they don’t ban the “Work from home part time and make thousands per month” type ads. I hope that they move to change their policy so that unsuspecting people aren’t taken for a ride by these kinds of scams. One final note – I began seeing an ad recently for a man named “Perry Belcher” who bills himself as the $200,000,000 man. I was curious why someone who has sold $200 million in goods and services was looking for a job and a quick Google search quickly enlightened me on who this person really was. Startups and business owners that see him pop up in your Facebook feed, do your homework before talking to this guy.